Cultured Marble Countertops - Should I replace or refinish my countertops? Cultured marble countertops are excellent candidates for refinishing instead of replacement. Cultured marble is a blend of marble dust and polyester resin and is often used for bathroom vanities, sinks and shower pans and walls. Over time cultured marble can become scratched, chipped, stained, or simply out-dated. Miracle Method can repair any damage and refinish the surface eliminating the need for expensive replacement and re-plumbing. Miracle Method extends the life of your cultured marble sink or vanity and can update the color of your countertops at a fraction of the cost of removal and replacement. Cultured Marble Countertops –Can they be repaired? 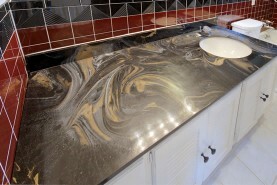 Cultured Marble countertops and vanities can easily be repaired. A man-made composite material, cultured marble is easily chipped, stained, or burned by cigarettes. 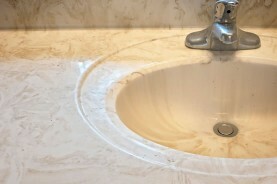 Cultured marble sinks often develop cracks around the drain. Called thermal shock, it is caused by fast, repetitive changes in temperature from hot to cold. Fortunately, any damage you have to your cultured marble sink or vanity can be easily repaired prior to refinishing. 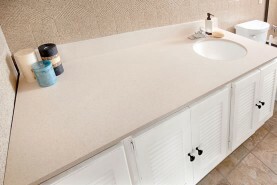 With Miracle Method’s Natural Accents™, dozens of attractive colors and patterns are available to restore your cultured marble vanities and sinks to the most current look. Cultured Marble Countertops - How much can refinishing save me? The amount of savings by refinishing cultured marble countertops and vanities over replacement depends largely on size and the complexity of your current countertop installation. See the difference refinishing can make! The bigger your vanity, the more expensive it will be to remove and replace. Non-standard length or shape will require a custom bid and fabrication. 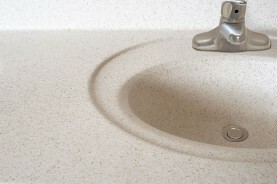 Non-standard sink or bowl location configurations will require custom fabrication. You may need a licensed plumber to disconnect, reconnect, and modify any plumbing during replacement. You may require a glass company to remove and re-hang the mirror that sets on top of your vanity during removal and replacement. Before you decide on a removal and replacement makeover, contact your Miracle Method professional for an estimate to refinish your cultured marble fixtures. Cultured Marble countertops - How do I find a professional to refinish my countertops? For the finest in cultured marble refinishing, click on Find a Location and get a free estimate from your local Miracle Method franchise. Only Miracle Method can provide a factory finish that will provide years of trouble-free service.